Genetic testing for mutations in fibrillin-1 (FBN1) and other genes has become an important and reliable option to aid in the diagnosis of Marfan syndrome and related disorders. However, the results of genetic testing for the diagnosis of disorders are not always straightforward. Therefore, working with a medical geneticist (a physician with training in genetics) or a genetic counselor is often necessary. 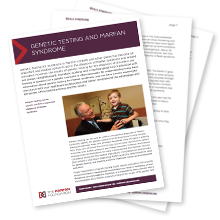 By understanding some basic information about genetic testing for Marfan syndrome, you can have a more meaningful discussion with your healthcare professionals and better comprehend the advantages and limitations of the testing process and the results. In what situations might genetic testing be recommended? Find these answers and more in the "Genetic Testing and Marfan Syndrome" download.